WBT offers wire mesh cabletray product and solutions for all your communications and datacom needs. Their trays are made of 100% recycled steel, with a finish that doesn’t need post-manufacturing chemicals, so you can be assured that your wire mesh trays are safe for the environment. 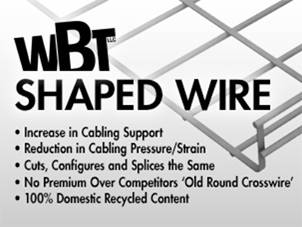 In addition to standard trays, WBT offers shaped wire baskets that provide a 400 percent increase in surface support area for your cabling, reducing strain up to 65 percent and increasing loading capacities. 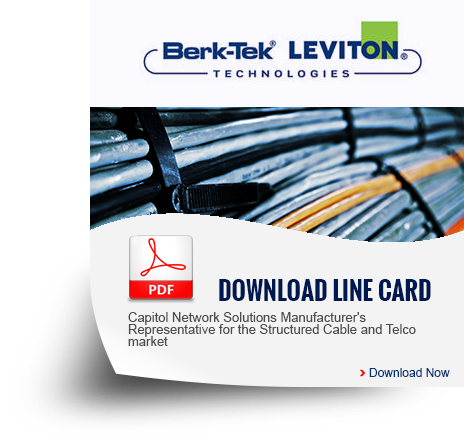 This is the perfect choice for 6A cabling or optical fiber, and a great choice for any other type. 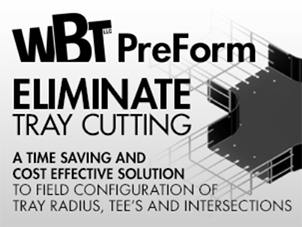 WBT also offers a PreForm option that allows you to save time and money by manufacturing sections precisely to the trays being utilized. There’s no cutting or configuring, so installation takes only a few minutes and you can avoid sharp protrusions. Their Under Floor tray systems also make installation easy – trays can be installed without tools or assembly, cutting back on the complexity of many underfloor solutions. 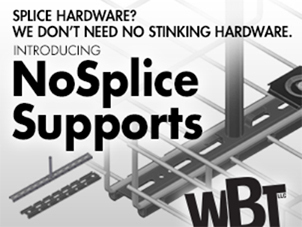 Make any installation easy using WBT’s new no splice system, which eliminates splice hardware. Their supports now act as both tray support and slice points, so a single hold down does everything, saving you time, money, and hardware. 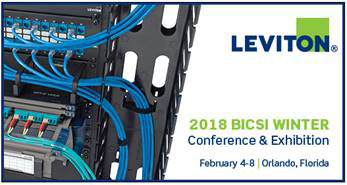 For more information, visit WBT.